Infusion pumps are generally used in hospitals, healthcare facilities and in home care settings to intravenously deliver controlled amounts of fluids containing nutrients and medications into patients’ bodies. They are designed to safely administer chemotherapy, analgesics and antibiotics. 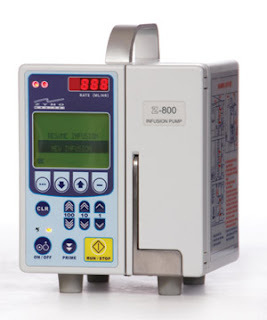 Infusion pumps are ideal for administering dosages that would be impractical to give manually or would be exceptionally labor intensive and prone to human error. The pumps accurately administer extremely small doses and can be programmed varying dosages throughout the day. Infusion pumps also enable patients to self-administer analgesics as needed while safeguarding them from overdosing. The two main classes of infusion pumps are used for different purposes and can be set to deliver a variety of infusion programs. Large volume pumps are used to provide patients with life-sustaining nutrients following schedules that closely resemble mealtimes. Small volume infusion pumps are used to deliver medications and analgesics. Depending on the type of medication and its purpose, small volume pumps may be programmed for continuous, intermittent of patient-controlled infusion. In continuous infusion programs, they are set to deliver continuous, small pulses of 5 microliters to 10 milliliters at a specified rate. Intermittent infusions programs are used to deliver medications that may irritate blood vessels and alternate high and low infusion rates in order to keep the cannula open at all times. On-demand infusions allow patients to administer controlled dosages of pain medications. Infusion pumps replace simple manual gravity administration sets in which the infusion rate is controlled by an assembly comprised of a flow restrictor, air filter and drip chamber. While capital costs of mechanical pumps are much lower than computer-controlled pumps, they are associated with higher operating costs since they must be closely monitored by medical personnel. Computer-controlled infusions pumps are more expensive than mechanical pumps but require much less oversight and are less costly to operate. They generally include redundant failover mechanisms that protect patients by ensuring continued operation in the event of power failure or other events. Many also include electronic therapy logs and sensors that trigger an alarm when the bag or syringe containing nutrients and/or medication is empty. A wide range of medical equipment manufacturers produce and market infusion pumps. Leading providers include Alaris, Baxter, Abbott, Hospira, Braun, Argus, Fluke Biomedical and many more.